My Fave Vacation Spot! Plus a vacay blogfest. What’s yours? 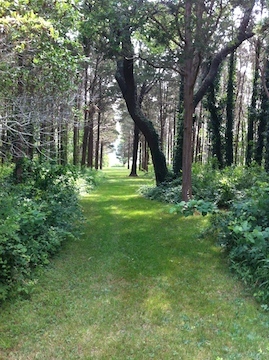 I’m taking part in this weekend’s “My Favorite Summer Vacation Spot” blogfest. So, I tell you what mine is. 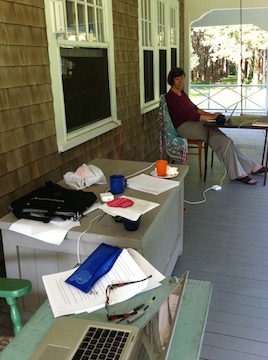 My yearly writing retreat in Cape Cod! By the way, you don’t have to be an official blogfest participant to comment, so comment away, and tell us yours. 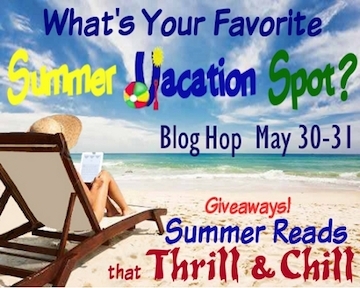 This Blog Hop is sponsored by Summer Reads that Thrill & Chill. For the Linky List and Book Giveaways visit the 6 Co-Hosts go to: Lexa Cain, Melanie Karsak, T.F. Walsh, Vanessa Morgan, Jolie Du Pre & Stuart R. West. Now, to the subject at hand… Why do I like this place so much? 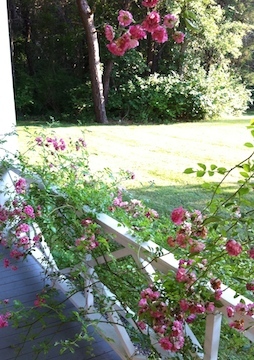 I’m vacationing, yet mingling with friends; I’m getting LOTS of writing done and talking about writing. Most of my novels were started here. 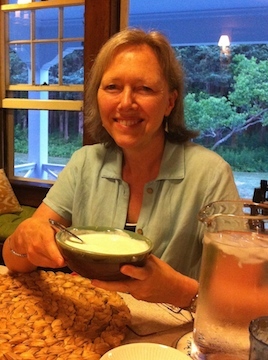 I get to swim in the ocean, be surrounded by pines and waterways, lounge on a rose-covered porch in my PJs, and every night someone cooks a great dinner, followed by fun writers’ games. Here are some pictures that tell the story over the years. Tell us all, what’s one of your fave vacation spots? 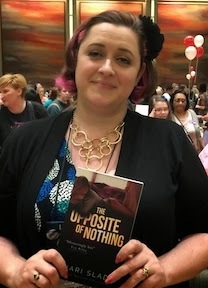 I just got back from Albacon, a small sci-fi con in Albany, and also RT Booklovers Con in Dallas. Both were a blast for different reasons. 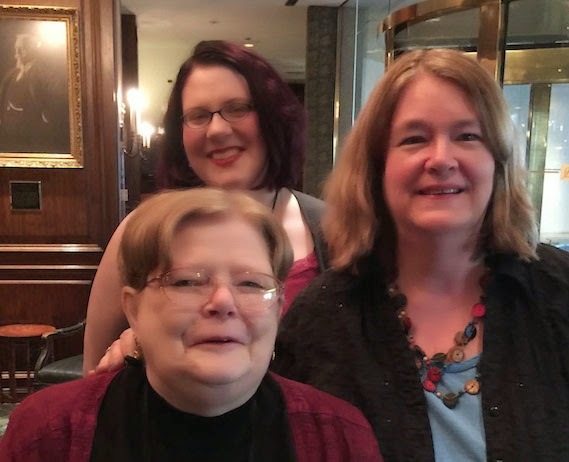 At the sci-fi con I got to be on four panels, which I loved. 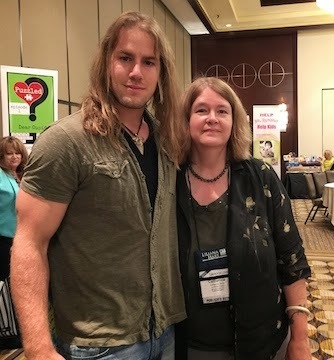 In Dallas I met and chatted with amazing authors, bloggers, readers and editors. I took photos of my fave authors and intriguing new ones. Wanna see? Tammara’s novel EASY was what got me into new adult lit. The story was so much deeper than I ever thought “romance” could possibly be. 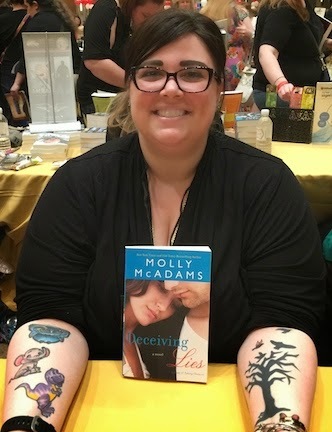 Check out the tattoos on the fabulous Molly McAdams. She helped take romance out of the Fabio era and into the new millennium. Shari Slade’s The Opposite of Nothing was intense and wonderful reading, however short. I look forward to more from her and it was fun to chat with her. 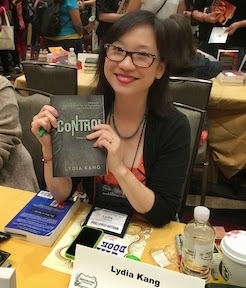 What a thrill to meet Lydia Kang in person after being friends online. 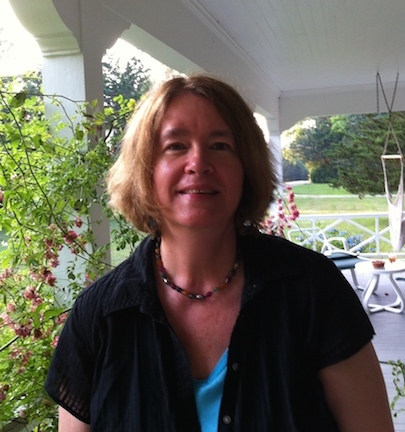 She writes great sci-fi for the YA crowd. 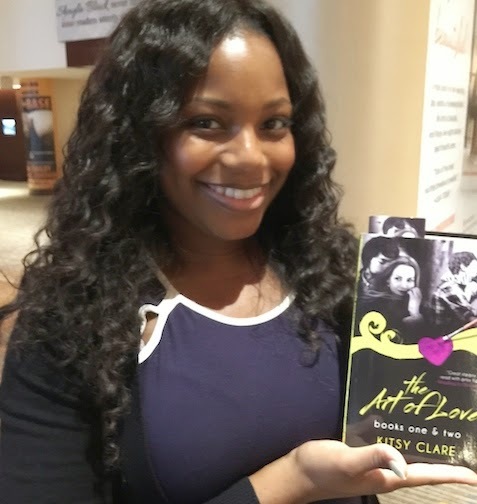 Hey, she’s holding my novel! And guess who was staying at my “overflow” hotel? The great legend that is Tamora Pierce! In case you’ve been living under a rock, she’s written dozens and dozens of fantasy novels over the years. Holy cow, I got to ride in the van to the main event and chat about houses, the perks of living upstate and other domestic fun. Who cared if we weren’t at the main hotel. 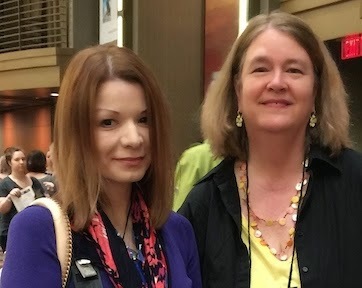 I got to see Tere Michaels again. 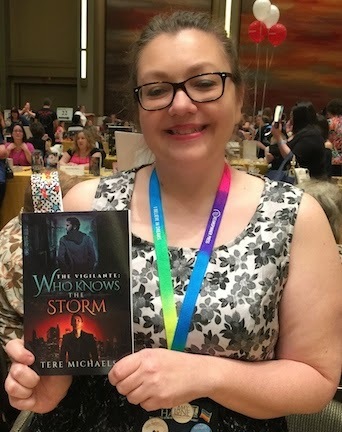 She wrote Who Knows the Storm, a fascinating dystopian novel with an M/M love element. Wasn’t sure it would be my cuppa tea, but hey, love is love, and boy, can Tere write! Her future, very noir NYC had my hair standing up. 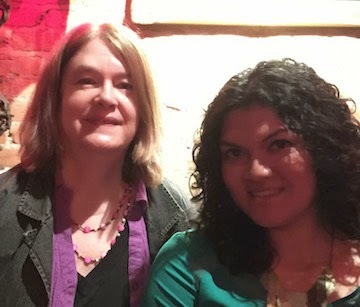 I met Zoraida Cordova who writes YA fantasy and often about the ocean like I do. Check out her Vicious Deep series. And last but not least, a couple of my own reader fans!!! 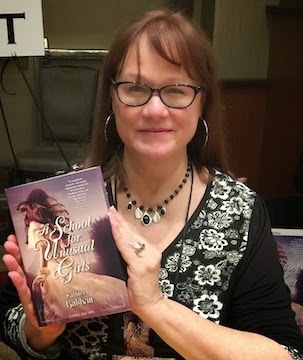 Kathleen Baldwin was on a panel, and her novel School for Unusual Girls sounded so cool, I have to load it on my kindle asap. 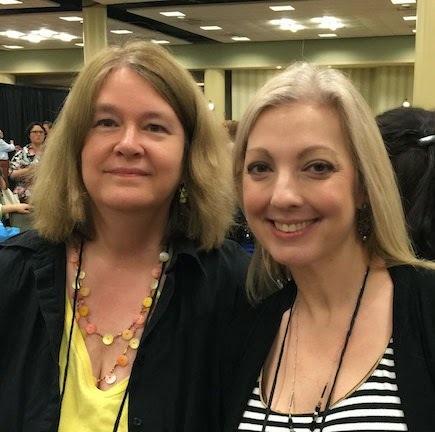 Here are my tips for attending book cons in a post for Untethered Realms.